During a free-wheeling keynote at a trade show hosted by the Advertising Specialty Institute® (ASI), political odd fellows Mary Matalin and James Carville riffed on national politics, debated America’s future and bandied predictions on a wide range of subjects, including Hillary Clinton’s upcoming pick for vice president. Carville, an unabashed liberal largely credited with engineering Bill Clinton’s 1992 presidential win, suggested Hillary Clinton could well choose former Iowa Governor Tom Vilsack, now U.S. agriculture secretary, as her running mate. 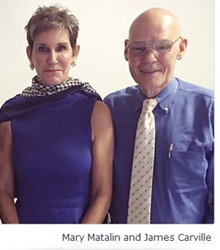 Matalin and Carville, who earned their political stripes working opposite sides of the aisle, appeared Thursday at McCormick Place before a packed house of small-business owners, entrepreneurs and CEOs attending ASI Show® Chicago, a three-day convention for members of the $22 billion promotional products industry. Timothy M. Andrews, president of ASI Show and president and chief executive officer of ASI, conducted the on-stage Q&A. ASI Show Chicago was attended by almost 650 exhibitors and nearly 4,300 distributors from 46 states and 10 countries, including 54 companies from Illinois, 48 women-owned companies and 72 minority-owned companies. The Advertising Specialty Institute (ASI; http://www.asicentral.com) serves a network of 25,000 suppliers, distributors and decorators in the $22 billion promotional products industry.